Synopsis: When the Taliban took control of the Swat Valley in Pakistan, one girl spoke out. Malala Yousafzai refused to be silenced and fought for her right to an education. I had been meaning to read this for a long time. Malala is such an inspirational person and is regularly referred to in our school as an example to others. 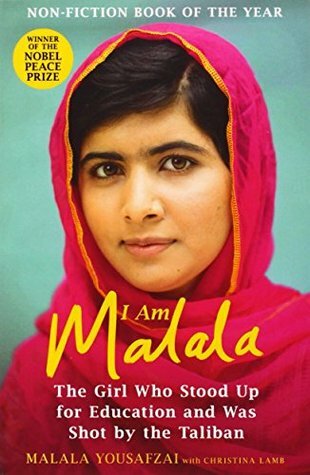 I knew some of Malala’s story before I started reading this but I really feel that I have experienced something special by reading her story. Malala is such a special young woman who will continue to be a source of inspiration for young women and people for many years to come. Her story is important and I was both interested and horrified to read of her life in Pakistan. I learnt so much more from this book than I even imagined that I would. I feel completely in awe of this wonderful young woman who truly is an inspiration to me and many others. Malala loves her country and I only hope that one day her dream of returning there will come true. I really enjoyed learning about the history of Pakistan, it was not something I expected from this book but I enjoyed it nonetheless. I also was completely captivated by Malala herself. Her outlook on life is so positive and I really feel that the world can learn so much from her. This is a profound and deeply moving account of Malala’s young and inspirational life so far. I can’t wait to watch the film/documentary that has been made about her. Check out the trailer below if you haven’t seen it already!